Presenting Bhinian Empire #1 City of a Thousand Dolls by Miriam Forster. 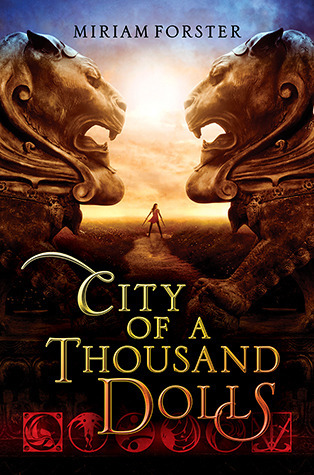 Vividly imaginative, culturally lush and exotically enriched, City of a Thousand Dolls proved to be an epic high fantasy with the best of both world. Maintaining a murder mystery that was not only vividly recognized and kept us tethered to our seats. Miriam Forster's world truly is a sight to behold. A mix of many known religions, noteworthy was the Indian origins of many of the story's aspects. Bhinian Empire is going to be a series that would pull us in time after time and we would find new things everytime we do so. City of a Thousand Dolls, is a lone estate and nurtured to train and care for the unwanted girls of the Empire. Music, dancing, healing, beauty and combat were some of the subjects girls are trained in and the author did a wonderful job of explaining and elaborating on each of the houses and how they worked. The mythos and the rules and regulations of this world and its history were also touched and Forster truly did not disappoint.... Of course there are talking cats too, how could we forget them. Some of the best parts involved them. The diverse fill of characters too brought their own into this world. Nisha as the protagonist was of course the one focused upon. Belonging to none of the houses, she makes her way as the Matron's assistant. Being her eyes and ears in the City, Nisha enjoys a lot of privileges. A dreamer, ignorant of her origins, Nisha is pretty happy with her lot in life. Then she catches the eye of the noble courier and starts to fantasize about a life outside of the city. She is a free spirited teenager who enjoys what life had bestowed on her and while she knows what is expected of her, she is hesitant to inform her desires to her noble paramour. But then close to an important celebration, murder strikes the heart of the city. One by one girls are dying, each scene more mysterious than the last, and Nisha finds herself as the investigator. And her well ordered life has turned into a chaotic mess, a simple misstep and her hopes of freedom world go up in flames. The secondary characters too had a role to play. Be it the cats (Jerrit, Esmer), the Matron, Devan, Tanaya, Akash or the Prince Sudev they all brought a level of vibrancy to the tale. The action and adventure and the mystery of the murders and the resulting suspense were all well paced witout overwhelming the story or its readers. Miriam Forster has provided us a gem and its is only just the beginning too. "A vivid, imaginative and culturally exotic high fantasy"
Oooh, this sounds great! Thanks for the review! I like books based on fictional world; surely going to be the next series I start reading.